GNADENHUTTEN, OH (February 27, 2017) – Iron Age Footwear (Warson Brands) held a partnership celebration event for Tusco Display and Stocker Concrete employees on Tuesday, February 27 from 11am to 1pm at Tusco Display in Gnadenhutten, Ohio. The fair-style event was comprised of several stations including a new boot series lacing ceremony, on-site sizing, fitting and ordering opportunities with US SafetyGear, raffle entry for free boots as well as a pizza lunch. Tusco and Stocker employees recently helped with the development process to inspire a new series of boots. Employees at both companies were given footwear to test out and provide feedback. Many of these employees were featured in the Iron Age marketing materials on display at one of the stations. Around 85 employees were in attendance throughout the two-hour event. They traveled through the stations set up in a cleared area inside the plant just beyond the office. Many were proud to find themselves showcased in the marketing materials; one worker asked for his photo to be taken with the trifold poster to send to family and friends. Event attendees browsed through boot samples presented on tables and a Tusco-made custom display. Several employees tried their luck at winning a pair of boots in the raffle. In addition to the Iron Age team, a representative from US SafetyGear helped associates with sizing and ordering. Employees dined on Zifaro’s Pizza, chips, drinks and cookies provided by the Iron Age team in the lunchroom. Each event participant went home with an Iron Age t-shirt and a unique key chain that can also be used as a bottle opener and flathead screwdriver. While Tusco Display continues to create point-of-purchase displays, Warson Brands continues to improve their footwear based on feedback from companies that fit their target market. The alliance has proven to be a win-win for all parties involved and Warson Brands was excited to show their appreciation with this event. For more information about Iron Age Footwear, please contact Brent Jennings at (314) 754-0382 or visit www.ironagefootwear.com. For more information about Stocker Concrete, please contact Braden Stocker at (740) 254-4626 or visit www.stockerconcrete.com. 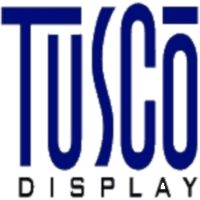 For more information about Tusco Display, please contact Mike Lauber at (740) 254-4343 or visit www.tuscodisplay.com. Located in Gnadenhutten, Ohio, Tusco Display is a manufacturer of custom retail displays and in-store fixtures. For over 60 years, finding ways to solve challenges cleverly and economically while making a difference for our clients has been a way of life. An expert in the areas of in-store marketing and consumer behavior, Tusco Display strives to transform shoppers into buyers with an ingenuity that shows and sells. For more information, visit www.tuscodisplay.com or call (740) 254-4343.